Dance Louisville has always strived to be the best ballroom dance studio in Louisville. 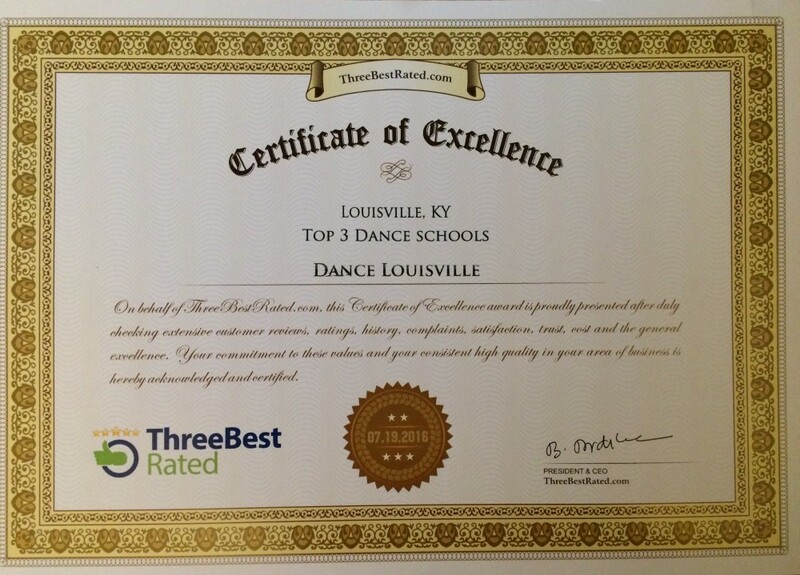 Recently we were rated one of Louisville’s Top Three Dance Schools by Three Best Rated company! Having been in business for over 10 years we take great pride in our reputation. We didn’t ‘do anything’ to receive this award outside of providing the city with great dance instruction day in and day out We are thrilled to have received this certificate and to share it with you! The goal of the company Three Best Rated is to give Louisvillians the top three businesses for very category in louisville. They look at ratings, history, reviews, complaints, cost, trust, satisfaction and their general excellence. As you can see here we have maintained the highest online reviews in our city! Why are we the best ballroom dance studio in Louisville? Dance Louisville has been in business for ten years. In that time we have created a very welcome atmosphere for our dance studio. We try to go above and beyond to give everyone that comes through the door the best service for them. We have everyone from competitive dancers, social dancers, and wedding lessons, to quinceaneras, teaching at elementary, middle, and high schools. At Dance Louisville we enjoy giving great service, and we look forward to continuing to give the same service we were awarded for years to come. We could not be more honored to have received this certificate. The Three Best Rated company has rated many more Louisville businesses. Here is a way to get a look at some other categories they have rated. I for one am very interested to take a look at what Three Best Rated have found for Louisville restaurants and many other services. If you interested in more information about Dance Louisville, and to see our calendar click here. We also have a special offer for you!